Meet Jessi Patel and her infant son, Benton, who reside in Toronto, Ontario. They represent the many households in Toronto in which the high costs of childcare and housing undermine the stability expected of a well-paying job. Jessi is returning to full-time work as an administrative assistant after maternity leave. She holds a Bachelor’s degree from York University and her yearly income sits slightly below the median income of lone-parent households in Toronto. Because she receives health and dental benefits from her employer, Jessi has barely any health-related costs per month. She receives no income from any other outside sources, apart from government transfers. Jessi currently spends $1758 on full-time, center-based daycare for 10-month-old Benton. She is currently on the waitlist for a daycare subsidy, though she only qualifies for a subsidy of $470/month – less than half of her monthly daycare costs. After dropping Benton off at his daycare near their home in the downtown core, Jessi drives to work outside the city, a trip that would otherwise take two hours each way by public transit. Her situation is further complicated when Benton gets sick; with no family nearby, Jessi has to find and pay for a last-minute emergency babysitter. Meeting the immediate needs of her family and trying to secure a future for Benton often ends up being a balancing act; for example, Jessi has opened an RESP fund for Benton to be able to attend college or university debt-free (a privilege she did not enjoy), but is often unable to afford the minimum monthly payment required to reach the minimum annual contribution – she relies mainly on tax returns to top up this account before the end of the year. With the RESP contribution and food portion of Jessi’s budget being the only line-items with any flexibility, miscellaneous expenses throughout the month are drawn from either one (or both) of these budgets. Even with a decent income and government support through the Canada Child Benefit and Ontario Child benefit, Jessi and Benton need to access their local food bank regularly throughout the year to ensure they have enough to eat. $22,074.52 above the poverty line (annual after-tax low-income measure). Toronto has the highest median full-time centre-based and regulated home child care infant fees in the country at $1,758 a month, or $21,096 annually. 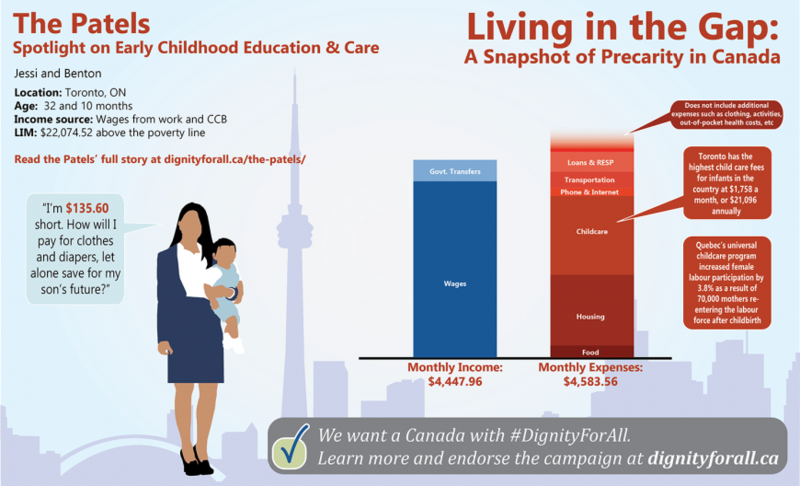 21% of single mothers in Canada raise their children while living in poverty. The rate among single fathers is 7%. 28% of racialized women live in poverty . Overall, racialized women earn 32% less at work. Single-parent families are most often female-led (80%), and of these households, Indigenous women, racialized women, and women with disabilities have higher poverty rates. Affordable, high-quality childcare remains out of reach for most families, further marginalizing children from equal access to quality care and women from the workforce. Quebec’s universal childcare program increased female labour participation by 3.8% as a result of 70,000 mothers re-entering the labour force. In a country as rich as ours, it is unacceptable that families cannot access and afford high-quality childcare. Add your voice to over 12,000 individuals, organizations, and government representatives who support Dignity for All’s comprehensive, rights-based anti-poverty plan. Together we can work towards a poverty-free Canada. Check out Dignity for All’s one-pager on Early Childhood Education and Care for more information.